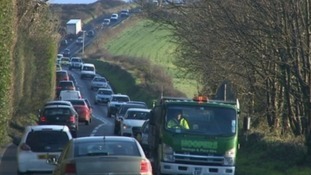 The 'dualling' of the A30 at Temple won't be finished until the summer. It was thought all work on the three mile stretch of road over Bodmin Moor would be completed by the Springbut contractors Kier now say it'll be July 13th before they have cleared the site. They say the four lanes of the dual carriageway will be open before then but haven't committed to a date. A long job, well done. When it is open all the waiting and frustration will have been worth it and this will be an end to the nine mile tailbacks, uncertain deliveries and a much improved holiday experience for our visitors. It's a stretch of road that's generated several decades of frustration for motorists travelling along it and one on which there have been a number of serious crashes. Business owners in the area say delays to the work are affecting trade. Kim Conchie, Chief Executive of Cornwall Chamber of Commerce, added: "The dualling of the A30 at Temple will provide much-needed additional capacity on Cornwall's major road. The revised date of completion, while unfortunate, will still be in time to absorb peak season traffic and Cornish businesses in the longer-term will see the benefit of reduced travel times year-round."